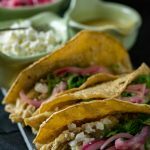 Instant Pot Dijon Pulled Chicken Tacos - What the Forks for Dinner? Instant Pot Dijon Pulled Chicken Tacos are the baby of Instant Pot Dijon Pulled Chicken. As I mentioned in my last post with Tim and I being just two…..we have leftovers from recipes frequently. Instant Pot Pulled Dijon Chicken had many leftover options! Tacos are one of Tim’s and I’s favorite foods!! Leftover chicken = tacos. This was almost too easy. The pulled chicken was already saucy and full of flavor, and some of the toppings are already in that recipe….Bonus!!! 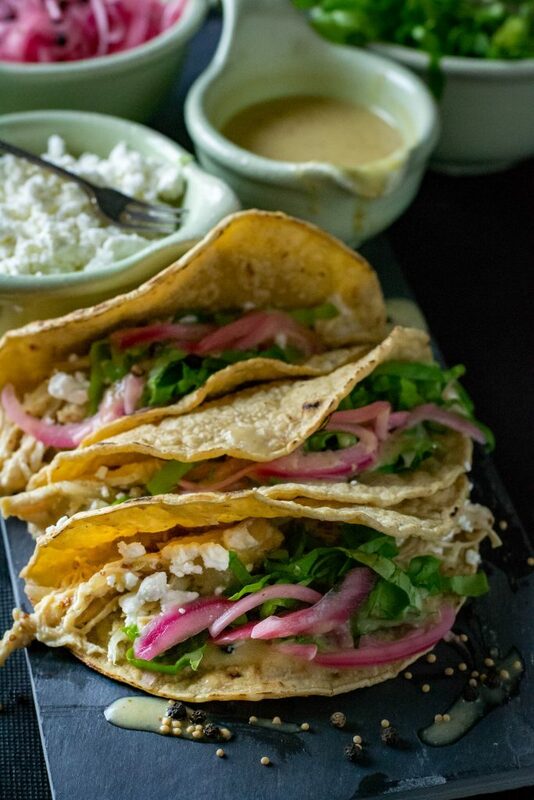 Corn tortillas are firm with a chewy texture wiyh the flavor of roasted corn….perfect for Instant Pot Dijon Pulled Chicken Tacos. 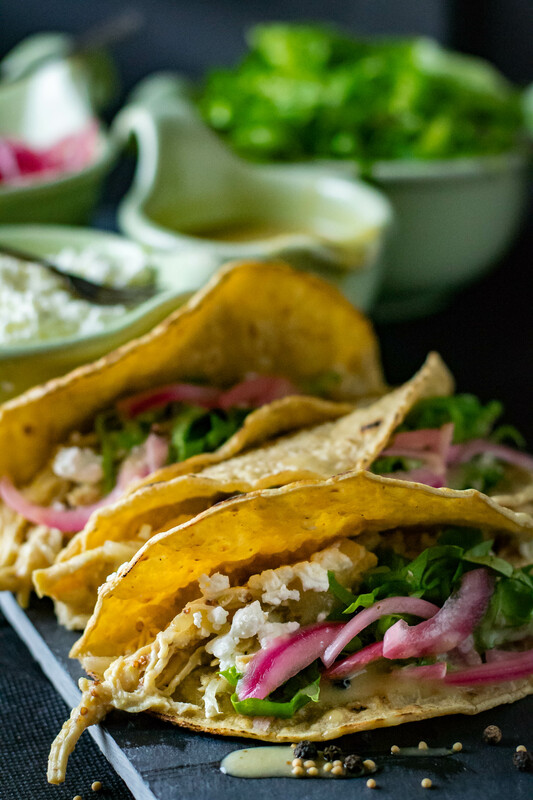 Tacos traditionally have cheese. When I decide to make these, my cheese choice was limited…..I had goat cheese??? It was perfect, creamy, and slightly tart. Shredded lettuce was the only other recipe need. I used a nice butter lettuce, but any shredded lettuce will work. 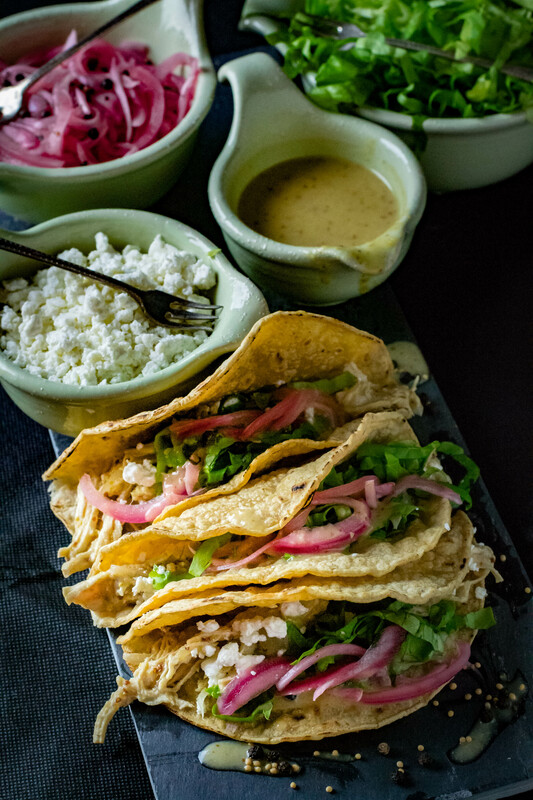 Assembly of the tacos goes as follows….corn tortilla, pulled chicken, goat cheese, lettuce, pickled red onions, and sauce if you so desire. Both Tim and I were actually amazed at how truly yummy these were! If you are looking for a uniquely different take on tacos try Instant Pot Dijon Pulled Chicken Tacos. 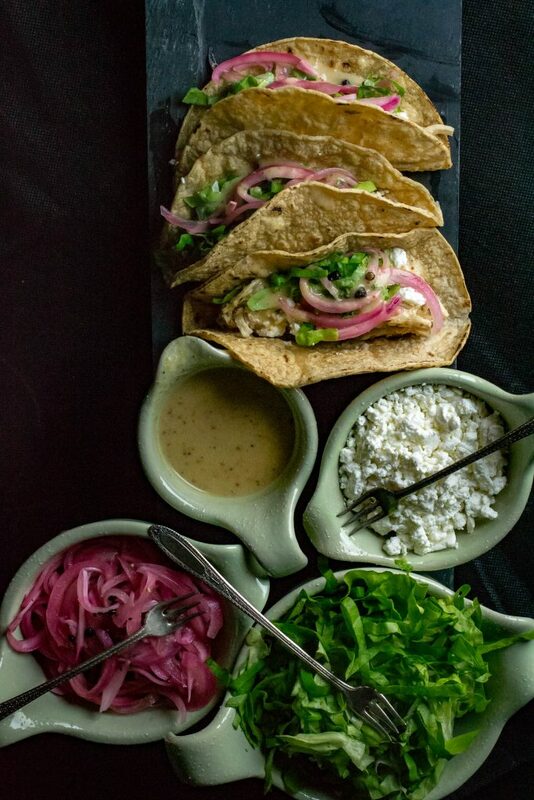 Uniquely different take on tacos, dijon pulled chicken, goat cheese, pickled onions, lettuce and creamy dijon sauce. To assemble tacos, place dijon pulled chicken on warmed tortilla. Sprinkle on goat cheese and top with lettuce pickled onions, and sauce.